I have an op-ed up at USA Today on the train wreck that was US Soccer testifying before the US Senate earlier this week. For 10 years, 2005-2014 I wrote a quarterly column for Bridges, a newsletter on science policy by the staff of the Office of Science & Technology at the Austrian embassy in Washington, DC. Thanks to Ami Nacu-Schmidt here at CSTPR all my columns have been formatted into an eBook, which you can download free. Thanks to the editors and staff of the OST and the Austrian government for hosting my writing over the years! In Fall, 2015, this talk will be shown in my graduate seminar, Science and Technology Policy. Here is a paper that I did with a then-grad student, Samantha Stevenson, which we never did get published. 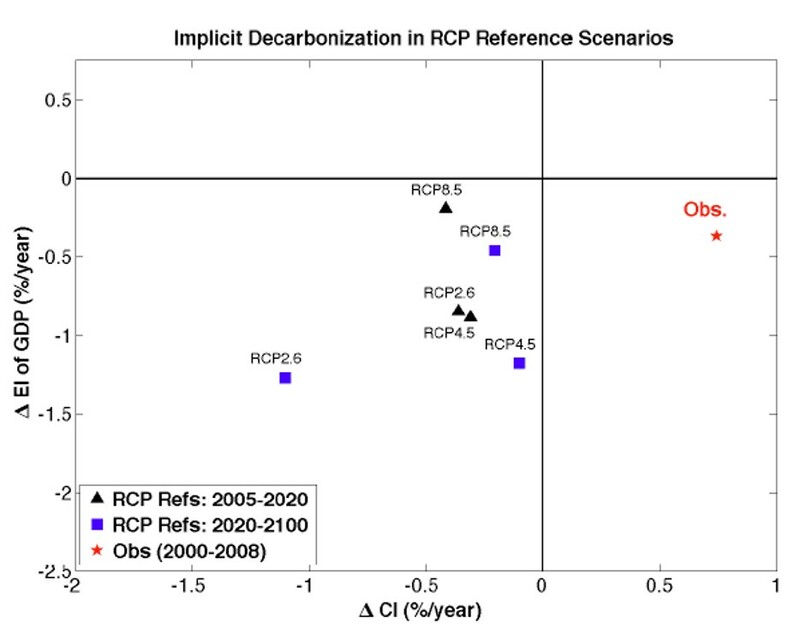 It was a follow-up to Pielke, Wigley and Green 2008 and found that the assumptions of spontaneous decarbonization embedded into the IPCC FAR were also present in the RCPs of the AR5. If that gobbledygook makes sense, then this is a paper for you. We’ve just posted it as a discussion paper. Caveat lector. Enjoy! Stevenson, S. and R. A. Pielke, Jr. (2015), Assumptions of Spontaneous Decarbonization in the IPCC AR5 Baseline Scenarios. a discussion paper, Written in 2012, Published July 2015. Projections of future climate change depend upon future anthropogenic greenhouse gas emissions. In preparation for its Fifth Assessment Report, the Intergovernmental Panel on Climate Change implemented a new approach to generating emissions scenarios, called ‘Representative Concentration Pathways’ (RCPs), which replace the scenarios in the ‘Special Report on Emissions Scenarios’ (SRES). The RCPs are designed to provide a range of emissions consistent with a particular radiative imbalance, but projected climate policy actions are heavily influenced by the choice of ‘reference’ or baseline scenario, often derived from the SRES. Here we show that ‘built in’ to the RCP reference cases are some of the same implicit and aggressive assumptions regarding rates of the decarbonization of economic activity found in the SRES . Rates of ‘automatic’ reduction in energy and carbon intensities in the RCPs in the absence of policy are broadly inconsistent with observations from 2000-2008. The ‘stabilization’ pathways used to drive physical climate models are more aggressive still, with reductions in carbon and energy intensities substantially larger than observed. The fact that much of the required improvement in energy and carbon intensities are built into the RCP reference scenarios has profound implications for our ability to evaluate climate stabilization goals. Over at The Least Thing (link) I discuss the graph above, which shows how sprint times evolve for the world’s fastest men. The outlier is Justin Gatlin, shown in red. This data, and much, more appears in my chapter on performance in The Least Thing. This site is for information and updates on me and my work. If you are looking for my sports blog, that is here.